Our vision is to create a welcoming, relaxing space for all who love yarn and fiber arts and crafts; a place that inspires creativity, beauty, community, and restfulness. We offer a variety of colorful, high-quality yarns, accessories, and resources. We provide learning opportunities for all levels of knitters and crocheters, expert assistance for customers, and a warm, well-lit space for those wishing to connect around our antique table for knitting and conversation. Come by the shop for a visit and some inspiration for your next knitting and/or crochet project. 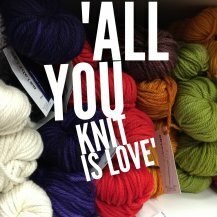 We hope you’ll enjoy our wide selection of lovely yarns and handy knit and crochet accessories. We also offer individual and group instruction and other special events. Our website is dynamic, like our yarn selections. Check here frequently, as we’ll update the site with news and photos regularly. Moe Traveled and Les Raveled are sheepy cousins whose home base is A Yarn Less Raveled. Moe really LOVES to travel and some of his favorite trips have been to Shetland Wool Week, Vogue Knitting Live in New York, Madrona Fiber Arts in Washington, and the Edinburgh Yarn Festival in Scotland. Les on the other hand, ADORES A Yarn Less Raveled and has so much to do here! Lounging in the cashmere as well as overseeing social media reports. Les visits with all our wonderful customers and helps them choose new projects, and periodically has a swing on the shop swift. Both Les and Moe were born from the Sheep! pattern by Susan B. Anderson. They’ve become our precious mascots, and we hope you’ll stop by to say hello. If you’d like to knit your own Sheep!, come into the shop and we’ll help you find just the right yarn to create your own special friend. Follow the adventures of Moe and Les on our Instagram and Facebook pages.